When her workday ends, Jenni Yan has choices about how to get to her South Philadelphia home. "If I get out on time, I take the bus," she said. "If I'm late, I'll take Uber or Lyft." Before ride-share services came to Philadelphia in 2014, the 27-year-old Center City nurse didn't have alternatives. If she missed a 4:15 p.m. Route 17 bus to South Philadelphia, the next one wouldn't come along for another 15 minutes or so. Now, she uses a ride-hailing app about twice a week if she misses her bus. Riders like Yan are contributing to a significant shift in the region away from public transit, particularly buses, to Uber and Lyft. SEPTA's 123 bus and trolley routes lost about 4.4 million ride trips from fiscal years 2014 to 2016, the agency reported, which mirrors shrinking bus ridership nationwide, according to the American Public Transportation Association. The region's bus ridership by linked trips in fiscal year 2016 was 114 million, the lowest it had been since 2003. Compared with 2013, the last full year SEPTA operated without ride sharing in the city, the 2016 ridership loss is even more significant. Last year's more than 161 million ride trips on both buses and trolleys was about 14 million shy of the ridership three years earlier. Construction and traffic congestion also depress bus ridership, but ride sharing is definitely contributing. "The combination of gas prices and Uber and Lyft give us so much external explanation for what we're seeing," Jarrett Walker, a Portland, Ore.-based transit expert who contributed to a redesign of Houston's bus service, said in a recent interview. SEPTA’s bus and trolley routes have experienced a 2.7 percent overall decrease in ridership from 2014 to 2016, with 70 of 120 routes posting losses, according to data provided by SEPTA. Routes operating in Center City and adjacent neighborhoods, as well as those in Northeast Philadelphia, were hardest hit. The ridership drop contributed to SEPTA's decision to commission Walker's firm to evaluate the region's bus system, a comprehensive review unlike any undertaken since buses largely supplanted trolleys in the 1950s, SEPTA officials said. The findings, expected to be available later this year, will likely feed a two-year plan to reinvent SEPTA's bus network. SEPTA didn't want to say what those changes would entail until Walker's review was complete, but anything from redesigning routes to working with the city to reallocate street space to make bus travel more efficient will be considered. "What we're really talking about is the future of cities," said Erik Johanson, SEPTA's director of business innovation. "Public transit is the lifeblood of cities. It's the only thing that feeds that density." Since its debut, Uber, the largest ride-hailing app business, has prioritized uniformly convenient service throughout the region. As of 2016, Uber had an average dispatch time of three to five minutes in every corner of the city and in all of the bordering municipalities, according to data released by the San Francisco-based company. In Center City and near Philadelphia International Airport the wait time was less than three minutes. Compare that with three years ago, when only Center City zip codes offered that speed. Most of the rest of the city waited five to 10 minutes, while those in the northernmost neighborhoods waited an average of 10 to 15 minutes. In Montgomery and Bucks County communities bordering the city, a rider typically waited no less than 12 minutes for an Uber. Since Uber began operating in Philadelphia in 2014, the average wait time in some zip codes far from Center City exceeded 10 minutes. Two years later, the average wait time in Center City was under 3 minutes, and no more than 5 minutes elsewhere. Lyft, Uber's primary competitor, did not provide such detailed dispatch information but said it had a four-minute wait time in most of Center City, though not citywide. "It changed a whole lot," Yan said from the backseat of a LyftLine, Lyft's carpool service. "I used to take the bus all the time or I'd start walking until I saw the bus come." Uber has about 20,000 drivers in the region, the company reported, who make their own decisions about where to seek riders, but Uber maintains a uniform dispatch time in part because passengers' destinations frequently draw drivers outside the city core, Uber spokesman Craig Ewer said. Offering recommendations on where to circulate, adjusting prices based on demand, and providing financial incentives to drivers who serve less densely populated neighborhoods are all tools the company uses to keep its drivers from bunching up in the city's population and business hubs, Ewer said. All that convenience available at the touch of an app has not led most bus riders to abandon public transit wholesale. They make decisions about which to use depending on circumstances. 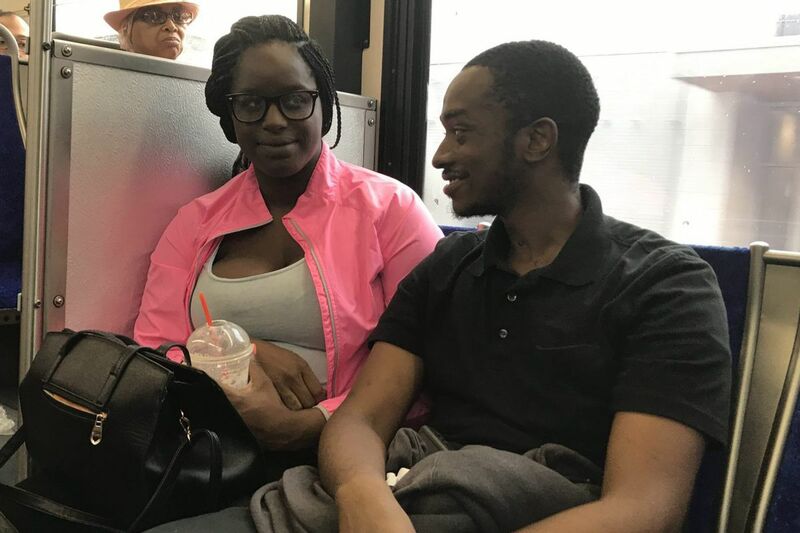 "If I'm going out to have fun, I'm using Uber and Lyft," said Dyrell Parker, 24, an animation student at the Art Institute of Philadelphia, as he rode the Route 23 bus. William Sampson, 25, rode the Route 47 bus north after working as a store remodeler for Acme supermarkets, and said he, too, uses ride sharing for late-night trips, but considers it an occasional luxury. "It depends on the funds, though," Sampson said. "If I'm low on funds, I'm catching the bus." The Route 23 and 47 buses are two of SEPTA's busiest routes, and each lost more than 7 percent of their ridership in the last two years, about 881,000 ride trips total. SEPTA has seen ridership become more concentrated during peak hours, with ridership dropping off at other times. The ridership dip is far from a crisis, Johanson said, noting bus ridership had reached a high as recently as 2012, but there is concern about a domino effect that, if left unchecked, could affect buses' reliability and financial viability. Every rider who decides to take an Uber rather than the bus represents another car on the road, he said. The more people who make that choice, the more Ubers and Lyfts crowd the streets, and the worse bus service gets. "You turn a bus of 45 people into 45 Ubers and all of a sudden you have a problem," said Jonas Maciūnas, a Philadelphia urban designer running JVM Studio. Slower, less reliable bus service leads to more dissatisfied passengers, who may also turn to ride sharing. Meanwhile, the gap between a bus line's expense and revenue would grow, making service less affordable. Uber disputes that its service congests streets. It is busiest at off-peak times when rush-hour traffic is over, Ewer said, and he pointed to a 2016 study commissioned by New York City that showed ride-share passengers were largely being drawn from cabs. The same study, though, said ride sharing could increase traffic if it began pulling a large number of passengers from subways. A 2017 study by transit analyst Bruce Schaller found that the growth of ride-hailing app vehicles "far outpaced" the loss of cabs on New York streets, leading to a total increase in cabs and ride-share vehicles. SEPTA partnered with Uber last summer to provide discounted trips to several suburban Regional Rail stations, and acknowledges ride-hailing apps can complement public transit, but also sees a competitor. The transportation authority took note in February when Uber tried a subscription pilot program with rates competitive to SEPTA's Regional Rail fares. Concerns about Uber and Lyft contributing to congestion also mean SEPTA won't partner with them in the city, Johanson said. Uber, for its part, does not see itself as SEPTA's competition, Ewer said, and offers its own public benefits. It discourages car ownership, Ewer said, offers a safe ride for people who might otherwise drink and drive, gives people who work unusual hours a fast option to get home, provides alternatives for neighborhoods underserved by public transit, and can connect riders to transit hubs. "In just a few years, ride sharing in Philadelphia has extended the transit system by providing more affordable options," Ewer said. How much SEPTA needs to adjust to compete with Uber is debatable. The future of the ride-hailing app industry is far from certain, with Uber running deep in the red as it subsidizes the cost of service to build its customer base. "Their prices are too low for them to be profitable," Walker said. "We must not be making public policy based on the current performance of Uber, because it's not sustainable." Walker added, though, that SEPTA was right to be looking at ways to better its service. Uber would not rule out fare increases, but Ewer said affordability is part of the company's business model. "While outside factors could conceivably have an impact down the road, we hope to maintain that affordability," he said. Whether Uber thrives or dies, though, Johanson said ride-hailing apps are too popular to fade away. SEPTA hopes to fill bus seats, he said, with new vehicles equipped with WiFi and electrical outlets, an express bus coming to Roosevelt Boulevard this fall, and plans for a new route between Fairmount Park and Grays Ferry. SEPTA could consider, experts said, all-door boarding, which SEPTA could do by installing SEPTA Key fare card readers on rear bus doors, and by cutting the number of stops on a bus route, which would speed up service. The Route 47 and 23 buses both operate with an on-time rate in the low 70 percent range. Some routes are on time less than 70 percent of the time. The goal for bus routes should be 80 percent reliability, officials have said. Walker emphasized there are few things a bus service can do on its own to dramatically improve service, and Johanson said SEPTA has been in conversations with the city to discuss what can be done in the city's street grid to improve better bus service. Analyzing on-time rates will be part of the coming study, Johanson said, as will making decisions about what SEPTA's mission should be in this century's new transportation ecosystem, whether SEPTA should aim for maximum coverage, getting at least occasional service to as many places as possible, or focus on boosting ridership. It's an existential question, and Maciūnas, for one, thinks focusing on ridership should be SEPTA's priority, even if it costs other places service. Provide buses that show up every five minutes on the busy routes, he argued, to match Uber's dispatch times. People use what makes life easier, he said, rather than arguments about the virtues of public transportation. "Don't tell people that it's their fault that traffic is bad because they're not riding SEPTA," he said. "Think of it as providing a lifestyle." On the Route 47 bus heading north, Darryl Lomax talked about how he uses the bus or ride-hailing apps. "This is much easier getting to work," the 36-year-old Philadelphia Streets Department worker said of the bus. "It would be almost counterproductive to drive because of rush-hour traffic. In the morning, it's a waste of time or money to take Uber or Lyft." On his off hours, though, when he wants to meet friends, the calculation changes. "Four dollars from here to the city?" he said of an UberPool ride from his home in Hunting Park to Center City. "Why not?" Taxi strike threatened if airport closes parking lot. Drivers’ mosque at risk.